I found a set of Friendly Village at Herberger’s a few years ago, along with a six piece completer set. I later added a tea set to the mix, which came from Bromberg’s, a very upscale shop in Birmingham, Alabama. 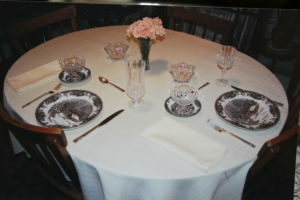 I set three different settings with this pattern, the first being a dinner party. I used the dinner plate, Great-Grandma Mayer’s Coronation silver plated flatware, and Longchamp stems by Cris d’Arques (thrift store). The centerpiece is a Lenox crystal vase (special offer from a credit card company) and a pair of Mikasa’s Diamond Fire votive holders (thrift store). The pale yellow table cloth and matching napkins come from Herberger’s.